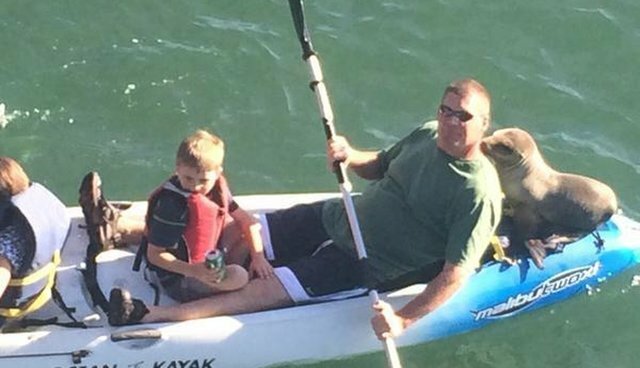 A father and two children had the experience of a lifetime when a sea lion decided to stow away on their kayak. As the family paddled, the friendly mammal stayed perched on the boat, apparently enjoying a break from swimming and a little affection from the humans aboard. Joe Buttitta, a reporter from local news station KEYT, spotted the surprise 20-minute encounter Saturday at Stearns Wharf in Santa Barbara, California. "The dad was petting it and rubbing its neck," said Buttitta, who was lucky enough to catch the scene on film. Sea-lion-cuddling father Ron Gist told KABC TV that the small sea lion stayed on the kayak for the ride into shore, describing the encounter as "absolutely incredible." "It was an experience we couldn't ever duplicate," he said. While sea lions are generally not a danger to humans experts say that, just to be safe, people should not approach them.